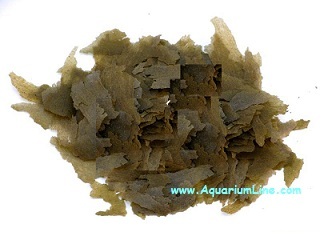 Flake food plant for the daily feeding of herbivorous fish, for which is required a greater intake of vegetable components, including algae. Ingredients: fish and fish derivatives, cereals, vegetable protein extracts, molluscs and crustaceans, yeasts, vegetable by algae (including Spirulina platensis min. 10%), oils and fats, brine shrimp, minerals. Wide variety of herbal ingredients from organic wheat, spirulina, soy, yeast, rice and cocoa. Administration: Several times a day in small doses.